I’ve also created a new SEO Gallery showing examples of SEO best practice from UK companies – you may want to check out the advanced SEO techniques being used. 1. The more pages on your site that are indexed by Google, the more visitors you will get. Every page on your site is an opportunity to attract visitors interested in your content and services. So make sure your index inclusion is 100% and Google’s robots can find ALL of your relevant content. If you’re international, display it for different country versions of Google. 2. If you create more pages with unique keyphrase rich content, you will get more qualified visitors, leads and sales. Make sure you use keyword tools to perform a gap analysis, identify target keyphrases and where you can’t optimise existing pages, create new content themed around your target keyphrases. Don’t forget that more pages can lead to visitor confusion, so you need a sound navigation scheme and clear positioning messages throughout your site. Another implication of this law is that every new page has an opportunity to attract visitors thanks to the long-tail effect, provided the creator knows the ranking factors and principles of SEO – so SEO style guides and training of content owners is vital. You can’t just leave everything to SEO specialists. This training doesn’t have to be that involved – I’m just talking sensible URL naming, unique titles and meta descriptions and use of keyphrases in headings and links. I find that not everyone is aware of the great tools available for assessing performance, so have compiled a list of the best keyphrase analysis tools for SEO. It’s a shame the old-favourite Overture is no longer performing, although it seems Yahoo! will revive it. If you create more quality internal links, you will get more quality visitors, leads and sales. I think everyone knows about the importance of external backlinks, but internal links have an important role to play in attracting visitors using your target keyphrases – particularly those from high PageRank pages which contain the right anchor text within the hyperlink. I have been collecting together some examples in an SEO Best Practice Gallery. Common examples are sitemaps, footer links, related product links, sub-categories menus including breadcrumbs, and body copy links particularly near the start of a document – again, content owners need to be educated to include those. Of course, it can be tricky implementing changes within an existing site design and navigation scheme, but you have more control of these links than external links. 4. If you create more quality external links, you will get more quality visitors, leads and sales. Most SEOs agree this is the most important factor in competitive markets. So, a proactive approach to link-building is needed with the aim of gaining links with good relevance about a topic that deeplink into relevant themed pages. Great content will also lead to more natural links, but it will only get you so far. You need to be proactive also. The challenges of who owns and pays for this must be overcome – is it a PR activity or a marketing activity? 5. If you spam, you will be found out eventually. So don’t spam. You need to ensure that an ethical approach to SEO is used. You need to work through with an agency how ethical you are, since there are many shades of grey. Put another way, you need to work out which colour SEO hat you wear – if you or your design agency are purists who wear a ‘pearly white hat’ then you won’t succeed with SEO, although you will have the warm glow of being totally ethical. Choose which colour hat you wear – these posts on ‘what is black hat SEO?‘ help explain that. Will Microsoft’s Windows Anytime Upgrade sink or swim? It’s hard to argue that Windows Vista hasn’t been a disappointment for Microsoft. 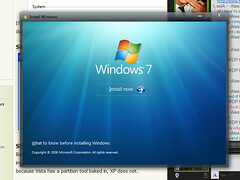 And it hopes the next version, Windows 7, will reverse its fortunes. Despite the fact that early reviews of Windows 7 provide reasons for hope, the success of it is far from certain. One of the biggest unknowns: whether or not Microsoft’s new Windows Anytime Upgrade will sink or swim.